In humid continental climates, it is common for moisture to find its way into homes, especially where there are weak spots in insulation coverage and efficacy. Residences located north of the GTA are susceptible to moisture damage in part because of the climate zone in which these buildings are constructed. If moisture becomes trapped behind walls due to insufficient insulation application, a host of issues can arise, from mold and mildew to water damage, and repairs are not always cheap. Moisture is not the only problem that can arise in a home with inadequate insulation and air sealing. Where there is air leakage, dust and pollutants could find their way into your home. One possible solution to this problem is spray foam, which is both an insulator and a sealant. This will improve air and heat control in your home. Using spray foam insulation can also reduce your energy bills all-season round as your furnace and air conditioner won’t be forced to operate on overdrive. 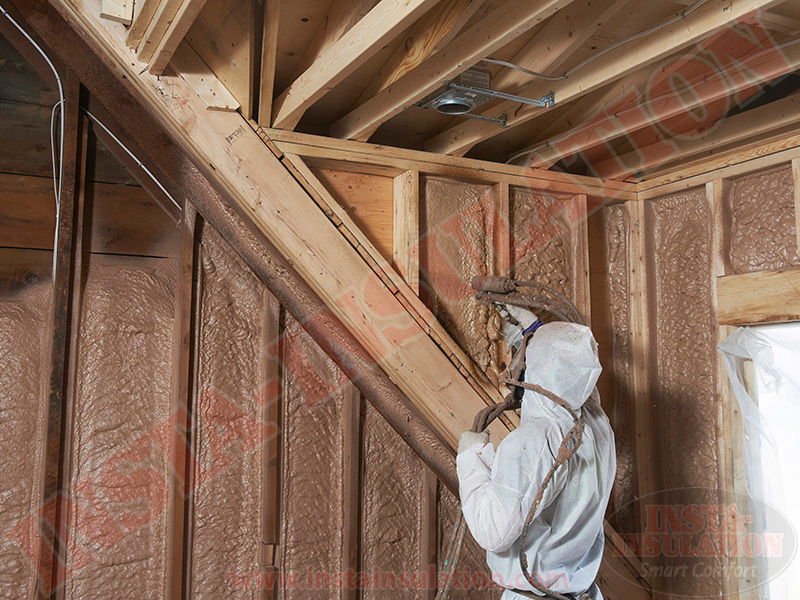 Insta-Insulation offers free insulation consultations to home owners located north of the GTA. To speak with one of our representatives, call us at 1-800-668-0311 or e-mail us at info@instainsulation.com. At Insta-Insulation, we offer a host of services to best suit all our clients’ insulation needs. Whether you are building a new home or insulating the nooks and crannies in your attic, Insta-Insulation has the expertise to ensure your insulation is done right. With over 25 years of experience in the insulation industry, we know how to determine which insulation system will work best in your home, whether that be spray foam or blown cellulose. If you need old insulation removed from your attic, we can help with that too. When energy bills rise drastically and usage hasn’t changed, one answer might be your attic insulation. It may seem high, but air infiltration and leakage is responsible for 40% of energy loss in your home. To better control air flow in your home, it is necessary to seal any gaps and use an insulation system that delivers air control properties. One system to consider is spray foam. It will take care of heat transfer and air leakage. Before upgrading your attic insulation, there are several areas in your home that must be addressed to ensure the upgrade runs smoothly. If the upgrade is not done properly, a mold problem could arise. At Insta-Insulation, we will inspect ventilation, exhaust, roof slope, and attic hatch condition prior to and during your attic upgrade. We will do this to ensure the attic upgrade you are investing in is done properly and won’t cause future headaches down the road. Is your energy bill higher than normal? Do you notice drafts in your home where there weren’t any before? These signs indicate there might be an air leak in your home, and our experience tells us the culprit is more than likely inadequate insulation coverage in your attic. Blown-in cellulose is a versatile, cost-effective insulation system to remedy this problem. The boric acid-based fire retardant in cellulose also combats moisture to stave off mold, and wildlife aren’t drawn to it, which means they won’t feel compelled to nest in your attic insulation. An added benefit of blown cellulose is its sound transmission properties. It attenuates sound, making your home quieter than ever before. Are your furnace and air conditioner less efficient than normal? Have your recent energy bills risen drastically, and usage and hydro rates haven’t changed? All these symptoms indicate a problem with your current insulation system. Spray foam insulation could fix this. At Insta-Insulation, we use Insulthane® Extreme, a two-pound medium density closed cell spray foam; it is in full compliance with new environment regulations mandated by the government, which will be effective in Ontario by 2020. This high-performance insulation system fills the crevices that traditional insulation cannot protect. By preventing leakage, your home heating and cooling systems will not be overworked. Because you will be using and losing less energy than before, you can expect to see energy savings up to 20%. Even your home resale value will increase thanks to spray foam insulation. Insulation may need to be removed from your attic for a number of different reasons, including wildlife infestation, mold contamination, smoke or water damage, and structural and electrical renovation. Some people may think that removing vermin from an attic space is all that is required to ensure your home is safe again, but this is not the case. Raccoons and other animals leave behind urine and feces, which could destroy your existing insulation as well as make you sick. Regardless of the reason for needing your insulation removed, Insta-Insulation can help you safely remove your old insulation and replace it with new, up-to-code materials. We even remove vermiculite insulation when the level of asbestos is equal to or below .5%. When it comes to insulation removal, Bryan Baeumler has trusted us for over six years, wherein he has used our services on Leave It to Bryan, DIY Disaster, and House of Bryan. If your home has had any issues with moisture, it is quite possible mold has formed in your attic. This is why we recommend home owners ensure their attic is inspected regularly, preferably every spring. If mold were to form, you could catch it and remedy the situation. After all, mold can spread in 48-72 hours. If you do notice mold growing upstairs, Insta-Insulation has the expertise to remove the mold from your home and prevent its unwanted return. It will take us approximately three to four days to ensure these unhealthy spores are removed from your home. During this process, we work in tandem with a mold remediation company. Many people are not aware that heat loss can occur in homes that have been insulated with high R-value systems. In this scenario, thermal bridging can occur when ceilings and walls have been insulated, but basement floors have been neglected. Heat will escape through the cold basement floor. This can be remedied with Insta-Panels. This insulated floor system is approved for under slab insulation for concrete floors. It does more than improve heat control in the home. It also helps to keep moisture out of the basement, which will improve the quality of your living space by hampering mold growth. In addition to dry floors and comfortable rooms, you will see a high return on investment. If you have closed your cottage for the season and are looking for a place in which to store your jet skis and boating equipment, an insulated shed may be exactly what you need. During winter, an insulated shed can help protect engines and batteries from damage caused by condensation and freezing. With your cottage equipment in safe, dependable storage, you can focus your attention on booking your next flight to Florida. If you live north of the GTA and would like to discuss any of the above listed services, please call us toll free at 1-800-668-0311.